Across the Curve has a post about pressure to lower prices… The culprit is the weakness of labor’s income to bolster prices. So now many companies are maneuvering to do whatever to cut prices. The last half of 2013 made this clear. Yet, some companies are not going to be successful at this game. These “cost-cutting challenged” companies are hiding in the woodwork… and they will progressively infect economic growth. The effective demand limit is biting down on the economy. More so if wage cuts or restricted hiring are part of the aggregate package to cut costs. The seeds of a coming contraction are being sown. This type of tight competitive environment for profits indicates the effective demand limit. When the economy is below the limit, profits can rise for most companies, but at the limit, profits get crowded out. Such that if one company gains profits, another company is losing profits. Price cutting is a reaction, especially when supply is so much more potent than demand. I wonder how many economists under their breath are concerned about the unemployment rate. The selloff of emerging market currencies and equities continued last week. A Bank of America report noted that investors withdrew $6.4 billion last week from emerging market stock funds, while bond investors are also showing signs of retreating. Moreover, the declines in currency values have expanded outside the “Fragile Five” of Brazil, India, Indonesia, South Africa and Turkey to include Argentina and Russia. What can policymakers do to offset the declines? This is not a premature ending of the business cycle. This is the natural level of real GDP that corresponds to the new low level of labor share. I have been saying that when real GDP hits around the $16.0 to $16.1 trillion point, that the effective demand limit would kick in and we would see utilization of labor and capital slow down. Well, real GDP is hitting that point now during 1st quarter 2014 after reaching $15.966 trillion in 4th quarter 2013. We are witnessing more than a correction. This is “effectively” the end of the business cycle expansion, domestically and globally for the US. The data will progressively reveal more weakness through the 3rd quarter 2014. The Agenda Project (which is behind Patriotic Millionaires, Top Wonks, and other progressive initiatives) is preparing an open letter supporting an increase in the minimum wage. They’re looking for more signatories. We are writing to ask you to put partisan differences aside to advance growth, prosperity and economic freedom by raising the minimum wage to at least $11.00 per hour and indexing it to inflation. We make this request as business owners, employers and investors who are members of the so-called Top 1%. 1. IT’S GOOD FOR AMERICAN BUSINESS. Workers with higher wages are consumers with greater disposable income. More customers with more money = higher profits for American businesses. 2. IT’S GOOD FOR AMERICAN TAXPAYERS. Minimum wage earners don’t make enough to support their families and as a result many rely on government programs to make ends meet. A decent wage would increase the number of self-reliant Americans and decrease government expenditures. 3. IT’S GOOD FOR AMERICA’S GLOBAL LEADERSHIP. The US is the richest county in the world but its minimum wage significantly trails that of other developed countries. In order to maintain its global leadership, the U.S. must ensure decent earnings for its working citizens. If you’re in that rarified company, your voice is incredibly powerful. Drop a line to Erica Payne (epayne at agendaproject.org) to add your signature. And if you know anybody who’s in that category, psssst: pass it on. Stocks were up a bit in the morning and when I just check now, wow, they have gone down quite a bit. Fun analogy for investing in stocks. Is it wise to expect continued output growth when most consumption was increased by high incomes? OK… so if business is shrinking for the middle class, it will just grow in other areas, right? “Since 2009, the year the recession ended, inflation-adjusted spending by this top echelon has risen 17 percent, compared with just 1 percent among the bottom 95 percent. 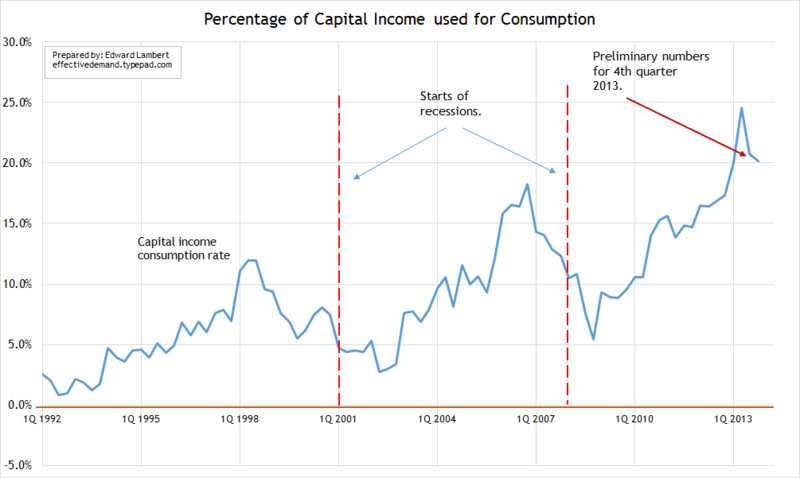 The increased consumption by capital income between 2009 and 2012 is seen in the following graph. Yet it peaked and has been coming down. This graph uses preliminary numbers for 4th quarter 2013. OK… business that caters to the rich are doing well, but there is a warning given in the article. Mr. Schwartz quotes an economist Steven Fazzari of Washington University in St. Louis. Economists like Krugman, Thoma, Baker, etc. expect real output to recover to levels close to those seen before the crisis. Yet, high incomes are starting to cut back consumption, even as labor share has already fallen 5% since the crisis. Are these economists in part basing their expectations of future output growth upon the increased spending by the rich over the past few years? If so, that is not wise, because the spending by high incomes is volatile. The “rich” will adjust their spending depending on movements in asset prices and profits. I foresee that we will see a drop in high-income consumption spending when the data for 1st quarter 2014 comes out in 3 months due to the downward shocks in the stock market. As long as stocks and other assets continued to rise in price, consumption by high incomes increased. QE helped bolster asset prices. Well, QE is being tapered. The little QE house of cards of trying to prop up asset prices is shaking. Are economists implicitly saying that asset prices will continue rising? I wouldn’t think that. The rich have their limitations too. I predict that higher incomes over the next 6 months progressively protect their incomes and consume less. This will be one of the drags on real GDP. 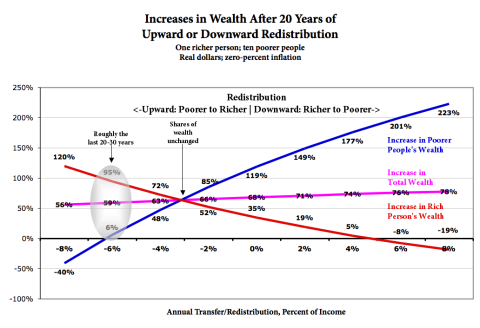 Does Upward Redistribution Cause Secular Stagnation? A while back I built a model to look at the long-term economic effects of upward and downward redistribution. Posts here and here. Commenter JGF pointed out an error in the model. I’ve revised and corrected it. The spreadsheet’s here. The model is based on marginal propensities to spend out of wealth and income. Poor people spend more of their wealth and income each year than rich people, so if income and wealth are less concentrated, there’s more spending. The model displays only one economic effect (there are many others, of course), and the effect is purely arithmetic. But as such, the effect is arithmetically inexorable. Here are the results. Explanations below. • Every individual’s wealth increases in almost every redistribution scenario. Rich and poor alike. 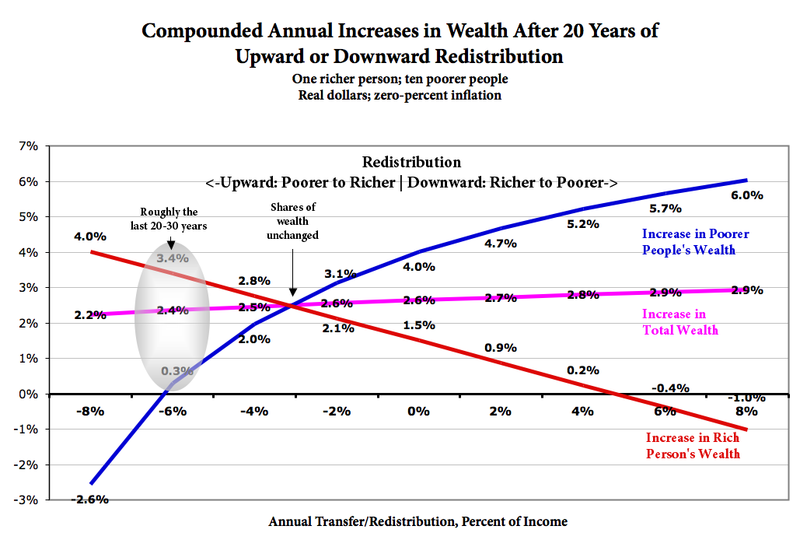 • Total wealth grows faster with downward redistribution. 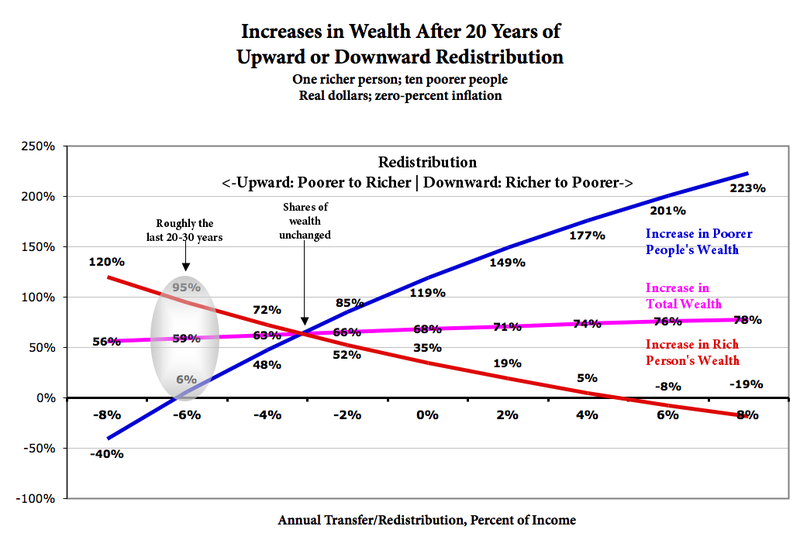 • Maintaining the status quo wealth concentration requires annual upward redistribution of about 3%. For the rich to maintain their relative wealth proportion, they have to be subsidized by the poor. • Note the exponential curves, with steep slopes on the left. The effect of upward redistribution is more powerful than downward redistribution. As upward redistribution increases, the rich get richer, faster. The poor stagnate or get poorer, faster. Ditto total wealth (though that effect is more muted). The opposite is true with downward redistribution; as it increases, the ultimate effect on end-of-period wealth gets steadily weaker. • Poorer people’s wealth grows 2.5X. • The richer person’s wealth (only) increases 1.2X. • Total wealth grows 1.7X, compared to 1.65X in the status-quo scenario. Is this Pareto efficient/Pareto optimal, “a state of allocation of resources in which it is impossible to make any one individual better off without making at least one individual worse off”? It depends on your counterfactual. “Worse off” compared to what? Compared to Year One, or compared to a different redistribution percentage? Everybody’s better off than Year One at almost every redistribution percentage. The rich person is less better off with downward redistribution than they’d be with upward distribution. But they’re not worse off than they were at the beginning. Meanwhile the poorer people are much better off with downward redistribution, and “everyone” is also better off. You decide. More spending causes more production, so more surplus, so faster growth. The rich person spends 30% of their wealth annually. The poorer people spend 80%. Some percent of income is transferred, redistributed, every year — upward from the poorer people to the richer person, or vice versa. The model doesn’t consider how the redistribution takes place — what forms it takes (explicit transfers and subsidies, labor vs. investment tax rates, minimum-wage laws, free public education and health care, whatever). Rather it just looks at the results of upward and downward redistribution, and the resulting wealth and income growth, and concentration versus diffusion. 1. Production yields a 5% surplus, which is transformed into monetary income via the magic of the private/central-bank/government financial system. Praised be the Lord. That production/transformation process is a black box. 2. Spending is a function of wealth. Rich people spend 30% of their wealth each year; poor people spend 80%. Since income is a function of wealth in this model, income and spending maintain a plausible relationship for all agents at all wealth levels. A more sophisticated consumption/spending function would incorporate interacting functions for spending out of income and spending out of wealth. But #3, below, would remain generally true. 5. There are no other behavioral effects. Of course, there are other behavioral effects. Incentives matter, blah blah blah. And there is price and wage inflation. To repeat: This model displays just one, purely arithmetic effect. But as such, that effect is arithmetically inexorable. The picture changes when you change the variables for the economic assumptions. The crossing point moves, and the curves change, but the basic shape doesn’t. I encourage my gentle readers to download the spreadsheet and run it through its paces. Time to end redistribution upwards: minimum wage increases would boost economy and lift all boats. No matter how much the business lobby complains about the “business costs” of increasing the minimum wage, legislators should look past that self-serving ideology and look at reality. Workers have contributed to increased productivity but received a stagnant to declining share of the income that comes from the increased productivity. IN the meantime, top-echelon managers and shareholders reap larger and larger benefits from the increased productivity provided by the workers. At the same time, much of the tax expenditure provisions in the Internal Revenue Code–from the charitable contribution deduction (and things like contributing appreciated assets from IRAs) to the mortgage interest deduction to the life insurance exclusion to the preferential rate on capital gains and the almost non-taxation of corporate dividends are hugely beneficial to the same top echelon in the income distribution, meaning that those provisions are aiding “redistribution”–just not the kind that is condemned by those on the right as a kind of socialism, since this redistribution is upwards and favors the rich. Note to Christie: Sleights of Hand Work Only If They Go Unnoticed. But what some of us suspected all along was that Christie didn’t yell at people because he was a get-results kind of guy; he yelled at people because he had anger management issues. And his office’s bizarre screed against David Wildstein, his former ally now turned enemy, confirms that diagnosis. Since the bridge scandal broke early last month, and it’s been reported that some now-high-profile Christie appointees have resigned or been fired, I’ve wondered from time to time what has happened to one obscure Christie appointee: the guy who Christie assigned to shadow him with a videocamera in public settings and capture his tirades at ordinary constituents. The purpose was to post the videotapes on YouTube: publicly humiliating unwitting foils as the road to reelection and higher office. George Will and I don’t agree on much, but last fall, after Christie made some highly-publicized vile comment to, if I remember right, a fan of a baseball team that was competing with Christie’s favorite team (or some such), Will wrote a column in which he made what struck me as a spot-on point. His larger point was that he dearly hoped that the 2016 presidential contest does not end up being one between Hillary Clinton and Chris Christie, but he made clear that his objection to Christie was that a pathologically rude person–someone whose stock-in-political-trade is gratuitous insults–should not be president, irrespective of any other considerations. After I read the full story on Friday about Wildstein’s lawyer’s letter, I thought any judgment about its meaning and effect was, rather obviously, premature. The letter provided no specifics at all. But after Christie’s office responded on Friday, saying that the attorney’s letter proved that Christie played no role in the decision to cause “traffic problems in Fort Lee,” I wondered whether Christie was now claiming it was Wildstein who texted deputy chief of staff Bridget Anne Kelly that it was “time for some traffic problems in Fort Lee,” rather than, y’know, the other way around. Wildstein’s apparent lack of documented evidence that Christie knew of the plan to cause traffic problems in Fort Lee before it was executed hardly means that no such evidence exists; it means only that Wildstein has no documented evidence of it. So an important question was, is Christie really going to claim now that the others who it already is known were involved in the scheme–Bill Baroni, Wildstein’s superior at the Port Authority; Bill Stepian, Christie’s top political advisor; Bridget Anne Kelly, his deputy chief of staff–were mere puppets of Wildstein? And now we have the answer, which is, yes. Otherwise, what in heaven’s name was the point of that really weird memo disseminated yesterday? Maybe that, as Krugman says, “This guy is scum. Everyone has always known that he was scum, since he was a teenager. And that’s why I appointed him to a major policy position”? Wildstein either has or knows of obtainable, documented evidence of whatever, or he doesn’t. And Wildstein was not the one who sent the text saying, “Time for some traffic problems in Fort Lee.” He was the one who received the text. Sleights of hand work only if they go unnoticed. What’s remarkable here, actually, is how many pundits were taken in by the Christie persona. How could they not at least have wondered whether this guy’s bullying style reflected deeper flaws? Yes. But his bullying style, in itself, should have offended pundits en masse, as deeply abusive of his official position, which was the source of his ability to so publicly misuse ordinary individuals. To reiterate: Good for George Will.